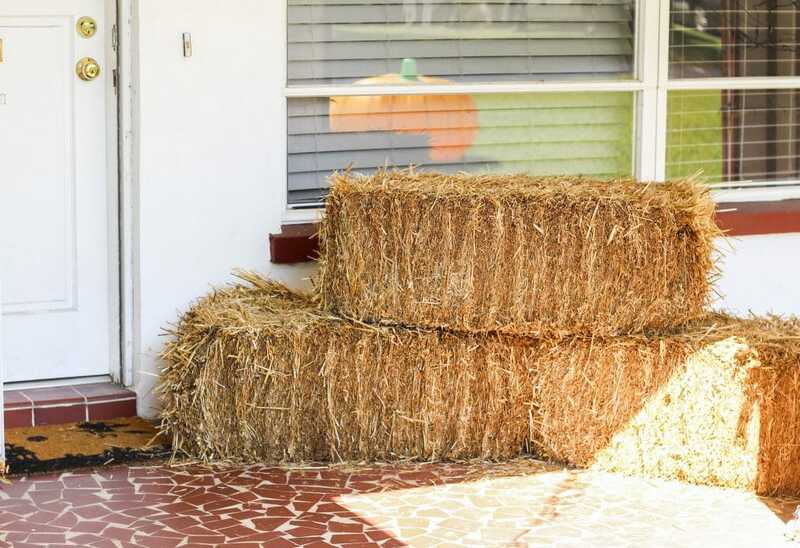 Decorate your front porch with hay bales, scarecrows, pumpkins, and mums for a beautiful fall display. 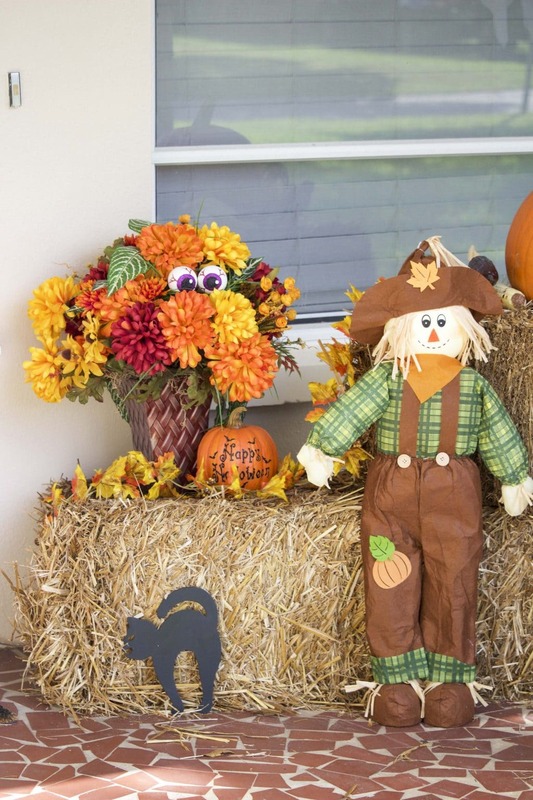 Choose the right pieces for your front porch fall decorations and you can set this up in September and leave it up until after Thanksgiving! As you all know, I’m seriously obsessed with the holidays. I’ve been talking to you all about fall for two months now! I love decorating to celebrate the season, and we go all out for Halloween and Christmas. I decorate the inside of the house and Travis is in charge of the outside lights and setup. You know, the manly stuff! Except for the front porch, I get to do that! I think it makes your home look so happy and inviting, when you have a seasonal display by the front door to welcome everyone inside. I like to buy pieces that I know I can use multiple times, and in different ways. 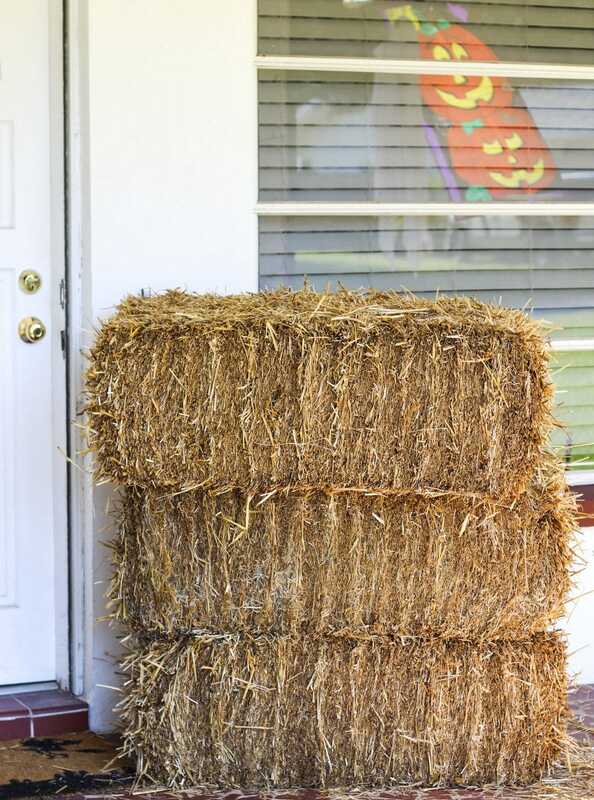 Although, I can’t save the hay bales from year to year, I do use them for fall, Halloween, and Thanksgiving! By slightly changing a few decorations, you can make this display last for a solid two months! I definitely think that’s worth the $30 I spent on the hay bales this year. I already had all the other pieces and I use them every year so it’s not too expensive to create this display. We don’t have any room to the left of the front door so I set up the display to the right of the front door. Pick which side you have the most room on so you don’t box in the area. You want it to feel open and welcoming.
. This year, I got the hay bales from a local produce market. Tip – Hay bales are extremely messy! If you can, bring a truck to pick them up in, so you can just blow out the back when you’re done. The little pieces of hay go everywhere. We put a blanket down in the back of my car, but somehow the little pieces still got into every crack and crevice. It was a hot mess. Sweep the front porch and surrounding area out first. Place the bottom two hay bales in a wide V formation. Add the third hay bale on top at an angle, I like to stagger them. After you get the shape you want, sweep again to get rid of the extra little pieces of hay that fell out while you were arranging the bales. 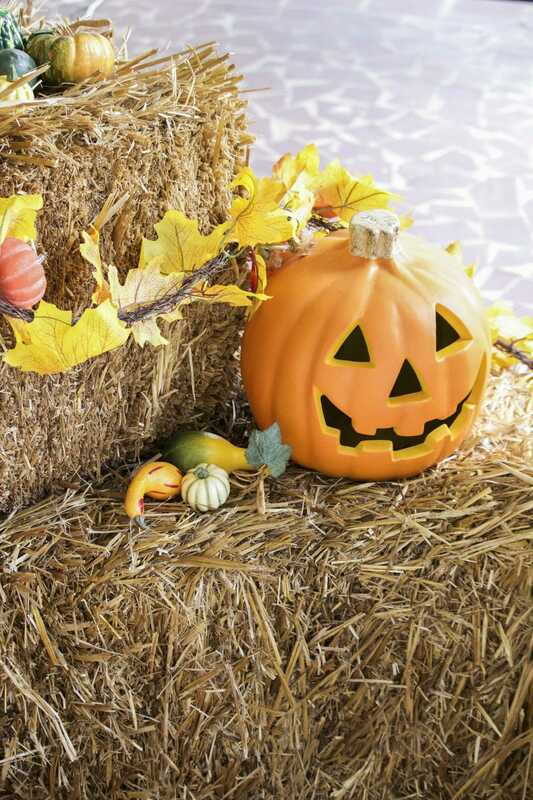 Add your garland, pumpkins, scarecrow, flowers, and seasonal decor. 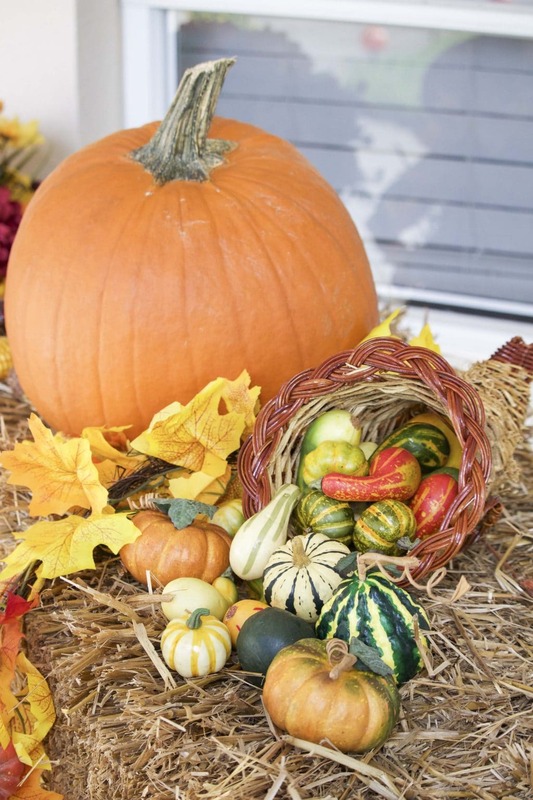 By using a few general fall pieces, you can leave your front porch fall decorations out from September to Thanksgiving and you’re maximizing the value you get from your display! The pumpkins can be used for Halloween and fall, but after Halloween take the Halloween decorations out and put out Thanksgiving decorations. I get our pumpkins early so we can display them from September to Novemeber. Last year, we painted them to look like minions so we couldn’t leave them out after Halloween, but if you just leave them plain they’re perfect for Thanksgiving too! What Decorations Should You Use? I like to use varying sizes and different shaped decorations in my front porch fall display. When everything is different sizes it gives variety and depth to the display. Try to group different colors and sizes together to create interest. You want people to stop at look at your display, not just drive right by! I just love when our neighbors who walk in the morning stop to look at our decorations…it makes me so happy! You just gotta have a scarecrow in your display, they’re classic! I also leave the fall garland out the whole time but a Happy Fall banner would be really cute to drape across the top too. 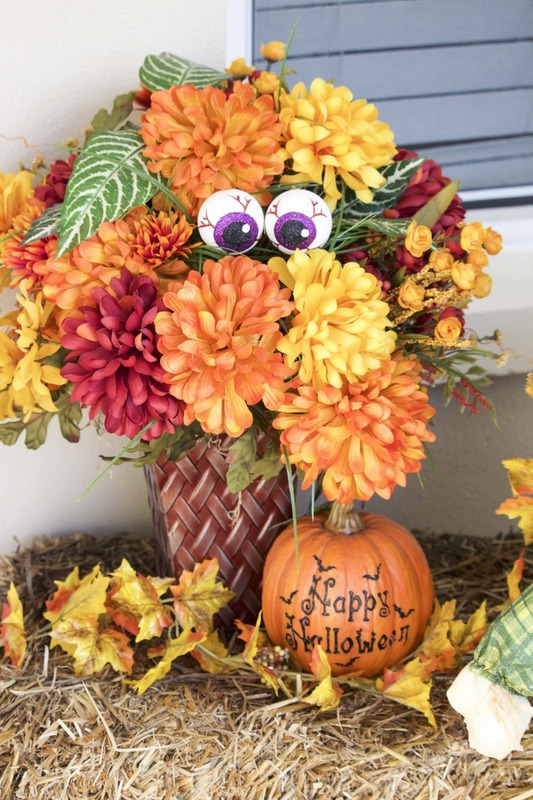 Don’t worry, I take the creepy eyeballs out of the plant after Halloween! Do you know what else I love for the fall display? Mums! They’re my favorite fall flower and I found the best place to get them. Costco! I got this HUGE mum for only $10.78 while Home Depot is trying to sell them for $25, yikes! Costco had purple and yellow, but the yellow just seemed more fall-ish to me. You can add these to your display or in front of the house. In addition to the mums, I used a faux flower centerpiece for the hay bales so I could re-use it each year. I also like to add a few pieces that light up to the front porch fall decorations display because it makes it look so magical at night! This year I swapped the small lanterns for a light up pumpkin. Tip – If you want to use a faux flower centerpiece like I did, don’t buy it now. Wait until the day after Halloween or the day after Thanksgiving when they will go on clearance! I got mine the day after Thanksgiving a few years ago at Michael’s for 75% off! Woohoo! 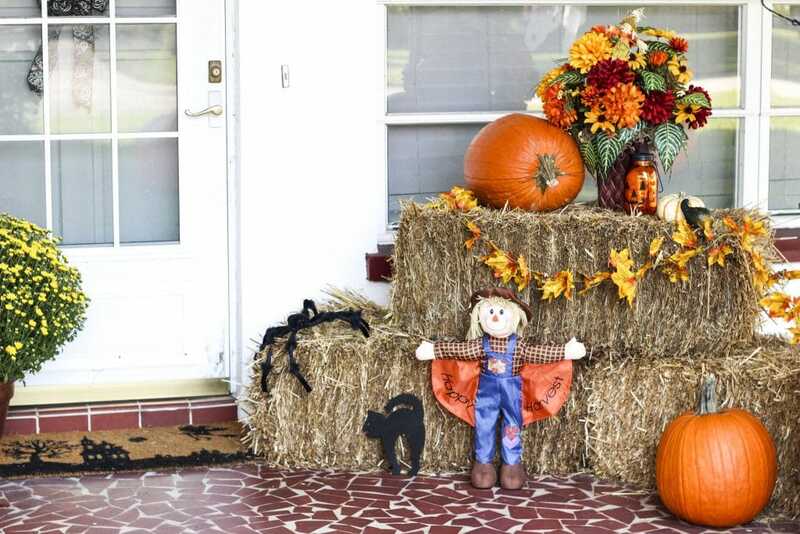 The picture below is of my front porch fall decorations from last year, as you can see I like to re-use most of the decorations I have but I try to switch it up a ltitle bit! I like to go shopping the day after holidays so I can pick up a few new things each year! Do you decorate your front porch for the holidays? Let me know in the comments! The above links are affiliate links. Any Amazon purchases made through these links help support StaceyHomemaker.com at no additional cost to you.